Umm, yess. We are totally doing cheese fries today!! I know, I know! I am beyond excited too! 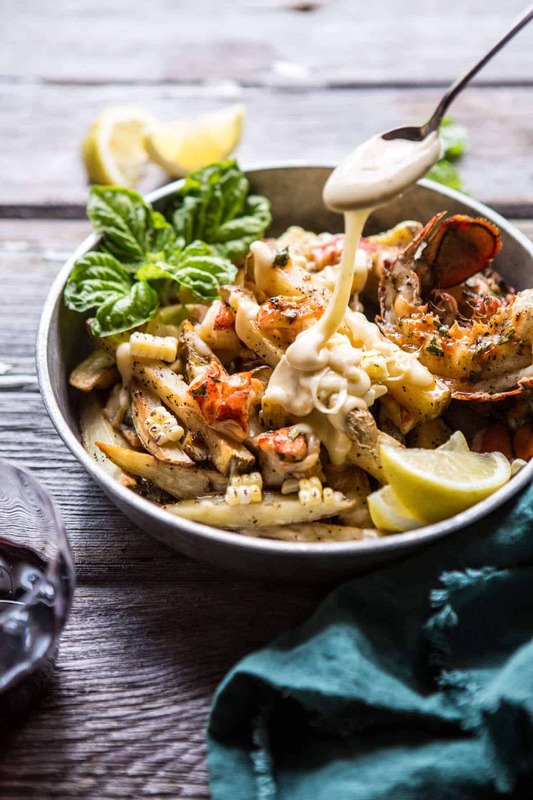 I mean, not only do we have cheese fries, but they’re cheese fries with buttery lobster, and an Aged Havarti cheese sauce, oh, and fresh grilled corn too. YESSS! It’s no secret that I’m pretty familiar with cheese. I mean, did you happen to catch my hour-long snapchat on Saturday? If not, it was a “summer cheeseboard 101”. 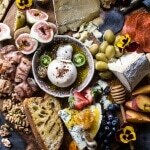 I went into full detail on all the cheeses, plus all the things you can and should be putting on your cheese boards. Not going to lie, I was probably kind of obnoxious, but hey, we made a pretty epic cheese board together! Anyway, while I’m really familiar with cheese, wine is a fairly new thing for me. Meaning, I really know not a thing about it. 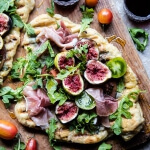 That’s why this little trip to wine country was so important for me…I mean, aside from eating amazing cheese and getting to talk about the grand old city of Cleveland with Michael Symon, of course. Yeah, so aside from those things, I also learned so much about wine and food pairings, which in my world is a very important topic to know about. While I learned a lot, I am not a pro, and still learning every day, but I now feel a little more confident putting out a bottle of Rose’ with my cheese board! Cool, cool! 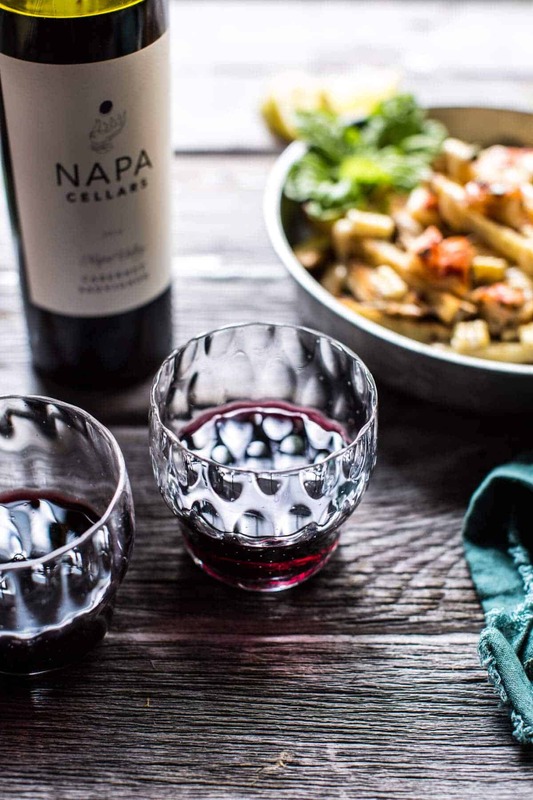 SIDE NOTE: can we just talk about Napa Valley for a second? Oh my gosh, to everyone who lives there or travels there often, I am so jealous! Napa Valley, CA might be one of the prettiest places you can live. I stayed in the town of Yountville, which is probably the cutest little small town ever. Plus, there’s a Bouchon Bakery there. While I didn’t get to eat there (it was a very short one day, one night stay), that bakery gives the town MAJOR bonus points in my book, you know? And yumm! 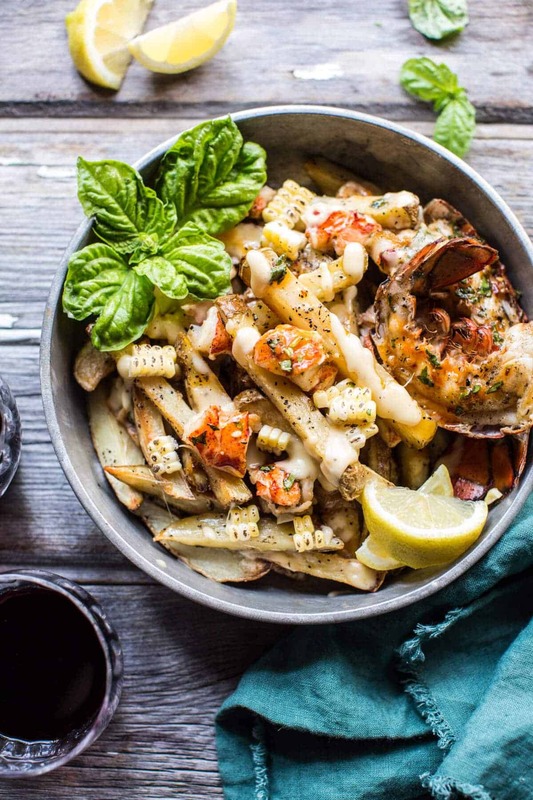 Alrighty, now let’s talk Sweet Chili Butter Grilled Lobster Fries! For the lobster, I grilled mine to make things super easy. Honestly, I think it took like five to ten minutes total and my tales were cooked and ready to be tossed in butter… oh that butter! You cannot do lobster without butter, so I did a spicy sweet butter with chilies, honey, garlic and basil. It is everything. And then, my favorite part! The cheese… I mean, yah. 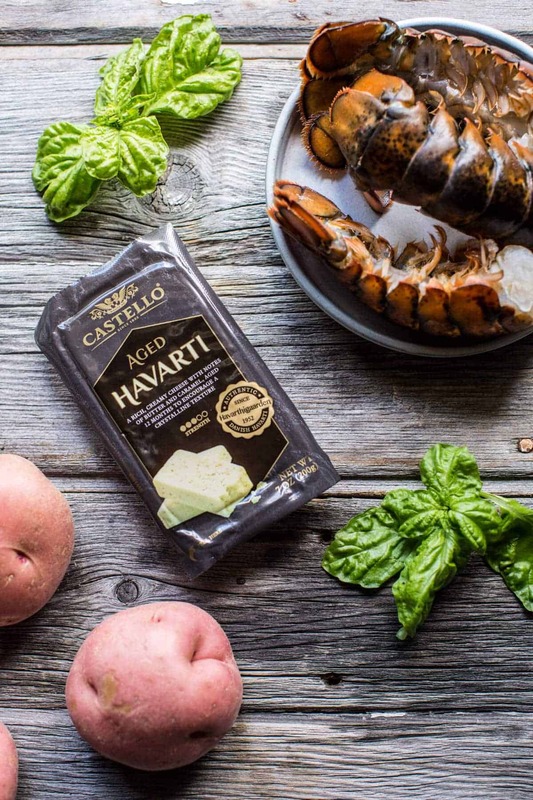 The Aged Havarti is the perfect paring with the lobster. It’s both creamy and buttery. DELISH. Now, taking what I learned in Napa, I paired these fries with Napa Valley Zinfandel. The perfect cheese and wine paring! 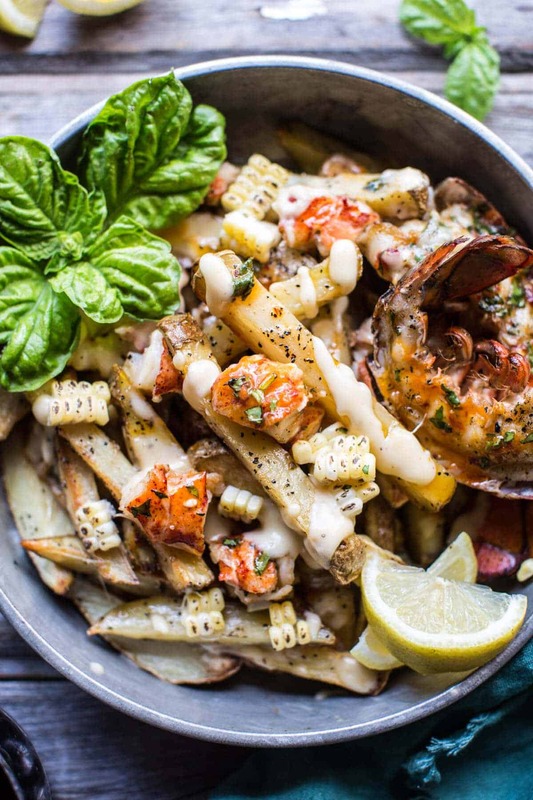 Sweet Chili Butter Grilled Lobster Fries with Aged Havarti Cheese. Place the potatoes on a large baking sheet and drizzle with olive oil, salt + pepper. Gently toss with your hands or two spatulas to evenly coat. Bake for 15-20 minutes, then flip and bake for 15-20 minutes more. You want the potatoes to be tender, but crisp. Remove from the oven and toss the hot fries with fresh herbs. Rub each lobster tail with olive oil and then place cut side down on the grill. Grill for 3-5 minutes or until light grill marks appear. Flip and continue cooking until the shells turn bright red, about 5 minutes. Remove the tails from the grill and let cool. Meanwhile, melt the butter over low heat. Add the garlic and cook 3-5 minutes until the garlic is golden and caramelized. Remove from the heat and the chili paste, honey and basil. Remove the lobster from the shell dice it into bite size pieces. 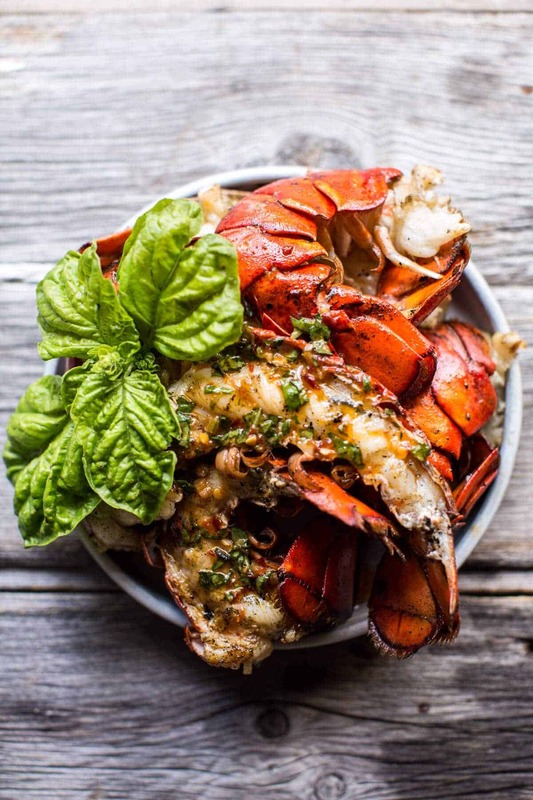 Drizzle the lobster with butter, you will have extra butter. 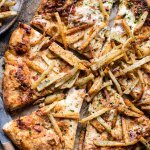 To assemble, divide the fries among plates and drizzle with cheese sauce. Add the lobster and grilled corn. Drizzle with a little more cheese sauce and then garnish with fresh basil and chives. 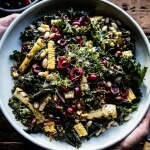 Serve with any remaining chili honey butter. Eat! 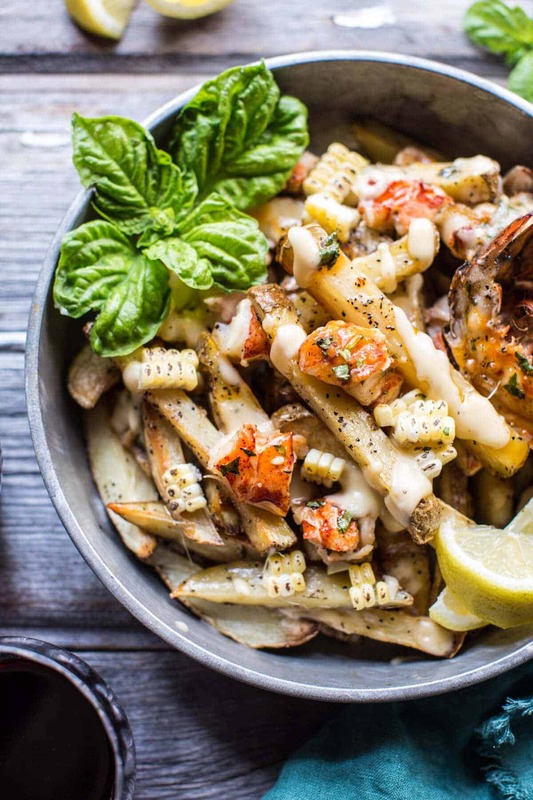 Cheese and Lobster Fries anyone? I’m down with that! Okay, so now I totally want to be in Napa right now. Definitely going on the bucket list. Thanks Tori!! I hope you enjoy these! dear god. DEAR GOD. 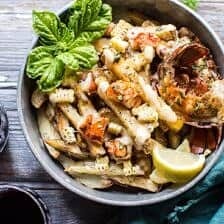 lobster fries and cheese? I absolutely have to try this. Also, these pictures are incredibly stunning. Wonderful job. I hope you love them when you get a chance to make them! Thanks so much Jessica! I can’t eat seafood but I do love cheese on everything. One thing I’ve learned stopping by here is using a variety of good cheeses makes food taste great. I used to get a bag of shredded cheese that just doesn’t do the job anymore. Now I have several blocks of cheese in the refrigerator thanks to you. Yes! Cheese is so good on so many things!! Thanks Nancy! you need to go back and try bouchon bakery!! their chocolate almond croissant is incredible (at least it was when i had it at their rockefeller center location) and eerything else that i’ve tried has been delicious as well. and model bakery (home to the best english muffins) and woodhouse chocolates (the place that introduced me to gianduja) are both must go’s if you’re in st helena! If I get back there I will definitely check it out! Thanks so much for the suggestion, I love those! Thanks Heather. Oh boy, do I love Zinfandel wine!!! It’s quite hard – not mention expensive!! – to come across it here in Portugal, but whenever I see a bottle, I tend to buy, eheh. Yeah, I know, we have amazing wines in my country, we really do, but being suhc a wine lover as I am, I love tasting wines from other countries as well!! Hmmm cheese fries!!! I absolutely love trying new wines as well! Thanks Miranda. We love havarti! We put tiny cubes of the dill version in a cornbread panzanella and heat a big slice of plain or jalapeno in a cast iron to serve with pita and roasted tomatoes – yum! 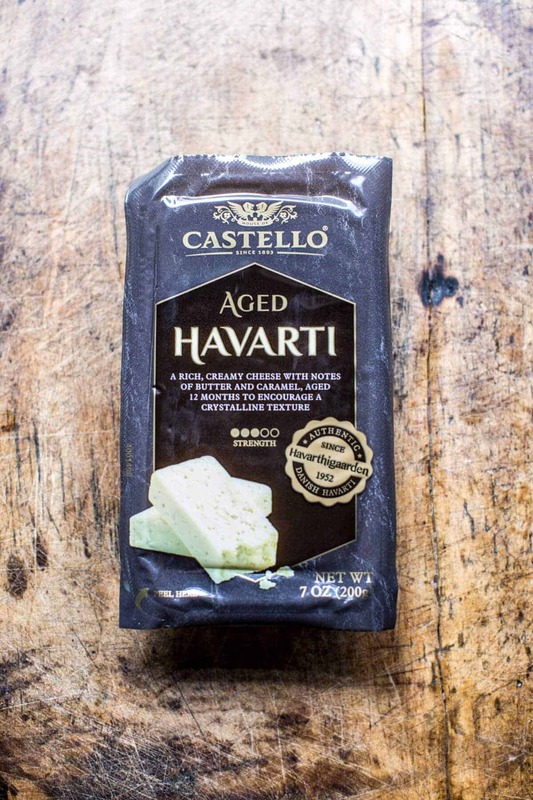 But, we’re intrigued by the idea of aged havarti. It sounds delicious! We are always in the mood for fries and cheese sauce, so I can’t think a better way to try it! Is Castello available in most supermarkets? Oh, how I LOVE Napa! My family isn’t into traveling, and while we only live 6 hours away, I’ve only made it through Napa twice. I haven’t got to explore at all, it was just a drive through, and stop at a few places my cousin recomended on our way home from Sacramento. BUT!! I fell head over heels in love the moment we entered the valley. Ugh. So, soooooo beautiful! If you go back, you must go to Napa Valley Olive Oil Co. It is the quaintest little shop, very old, crumbling, kind of dark. But it has the most fantastic local and imported foods! Wonderful cheeses, and the most delicious dried fennel sausages from San Francisco (another place you should go. It’s AMAZING!). The olive oil is, of course, fantastic. Their imported food section is pretty incredible to me. I live in a teeny tiny town in northernmost Ca, and we can’t find anything here! The favorite part of my sisters and brother are the orange trees outside, that just happened to be loaded with ripe oranges while we were there both times that the shop owner said we could pick and eat. I don’t even like oranges, and they were sooooooo good! It’s such a fun little pkace, and I can’t stop talking about it! I really want to go back, and eat at Bodega, and all of Thomas Keller’s places. I am obsessed with all of his cookbooks! That sounds awesome Brittney! Thanks so much for sharing these places, I will have to check them out they sound amazing!! Second, THIS. Oh yummy. This. I want to head over get lobster right now and make this. It seems so delish! I’ve had lobster like twice in my life so far. Both time this summer. I loved it. I don,t know why I didn’t tried it earlier ! But so far i haven’t tried it grilled, only boiled. This seems the perfect way to try it grilled !!! Ugh, I’m obsessed with you. This looks amazing. Made it tonight and it was delicious! That is what I love to hear!! Thank you Kelly!